"Great Wall" redirects here. For other uses, see Great Wall (disambiguation). The Great Wall of China is a series of fortifications made of stone, brick, tamped earth, wood, and other materials, generally built along an east-to-west line across the historical northern borders of China to protect the Chinese states and empires against the raids and invasions of the various nomadic groups of the Eurasian Steppe with an eye to expansion. Several walls were being built from as early as the 7th century BC; these were later joined together and made bigger by Qin Shi Huang (220–206 BC), the first Emperor of China. Little of that wall remains. Later on, many successive dynasties have repaired, maintained, and newly built multiple stretches of border walls. The most well-known of the walls were built during the Ming dynasty (1368–1644). The frontier walls built by different dynasties have multiple courses. Collectively, they stretch from Dandong in the east to Lop Lake in the west, from present-day Sino-Russian border in the north to Qinghai in the south; along an arc that roughly delineates the edge of Mongolian steppe. A comprehensive archaeological survey, using advanced technologies, has concluded that the walls built by the Ming dynasty measure 8,850 km (5,500 mi). This is made up of 6,259 km (3,889 mi) sections of actual wall, 359 km (223 mi) of trenches and 2,232 km (1,387 mi) of natural defensive barriers such as hills and rivers. Another archaeological survey found that the entire wall with all of its branches measures out to be 21,196 km (13,171 mi). Today, the Great Wall is generally recognized as one of the most impressive architectural feats in history. In Chinese histories, the term "Long Rampart(s)" (長城, changcheng) appears in Sima Qian's Records of the Grand Historian, where it referred both to the separate great walls built between and north of the Warring States and to the more unified construction of the First Emperor. The Chinese character 城, meaning city or fortress, is a phono-semantic compound of the "earth" radical 土 and phonetic 成, whose Old Chinese pronunciation has been reconstructed as *deŋ. It originally referred to the rampart which surrounded traditional Chinese cities and was used by extension for these walls around their respective states; today, however, it is much more often the Chinese word for "city". The longer Chinese name "Ten-Thousand Mile Long Wall" (萬里長城, Wanli Changcheng) came from Sima Qian's description of it in the Records, though he did not name the walls as such. The AD 493 Book of Song quotes the frontier general Tan Daoji referring to "the long wall of 10,000 miles", closer to the modern name, but the name rarely features in pre-modern times otherwise. The traditional Chinese mile (里, lǐ) was an often irregular distance that was intended to show the length of a standard village and varied with terrain but was usually standardized at distances around a third of an English mile (540 m). 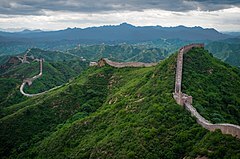 Since China's metrication in 1930, it has been exactly equivalent to 500 metres or 1,600 feet, which would make the wall's name describe a distance of 5,000 km (3,100 mi). However, this use of "ten-thousand" (wàn) is figurative in a similar manner to the Greek and English myriad and simply means "innumerable" or "immeasurable". Because of the wall's association with the First Emperor's supposed tyranny, the Chinese dynasties after Qin usually avoided referring to their own additions to the wall by the name "Long Wall". Instead, various terms were used in medieval records, including "frontier(s)" (塞, sāi), "rampart(s)" (垣, yuán), "barrier(s)" (障, zhàng), "the outer fortresses" (外堡, wàibǎo), and "the border wall(s)" (t 邊牆, s 边墙, biānqiáng). Poetic and informal names for the wall included "the Purple Frontier" (紫塞, Zǐsāi) and "the Earth Dragon" (t 土龍, s 土龙, Tǔlóng). 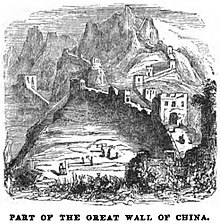 Only during the Qing period did "Long Wall" become the catch-all term to refer to the many border walls regardless of their location or dynastic origin, equivalent to the English "Great Wall". The Chinese were already familiar with the techniques of wall-building by the time of the Spring and Autumn period between the 8th and 5th centuries BC. During this time and the subsequent Warring States period, the states of Qin, Wei, Zhao, Qi, Yan, and Zhongshan all constructed extensive fortifications to defend their own borders. Built to withstand the attack of small arms such as swords and spears, these walls were made mostly by stamping earth and gravel between board frames. King Zheng of Qin conquered the last of his opponents and unified China as the First Emperor of the Qin dynasty ("Qin Shi Huang") in 221 BC. Intending to impose centralized rule and prevent the resurgence of feudal lords, he ordered the destruction of the sections of the walls that divided his empire among the former states. To position the empire against the Xiongnu people from the north, however, he ordered the building of new walls to connect the remaining fortifications along the empire's northern frontier. "Build and move on" was a central guiding principle in constructing the wall, implying that the Chinese were not erecting a permanently fixed border. Transporting the large quantity of materials required for construction was difficult, so builders always tried to use local resources. Stones from the mountains were used over mountain ranges, while rammed earth was used for construction in the plains. There are no surviving historical records indicating the exact length and course of the Qin walls. Most of the ancient walls have eroded away over the centuries, and very few sections remain today. The human cost of the construction is unknown, but it has been estimated by some authors that hundreds of thousands, if not up to a million, workers died building the Qin wall. Later, the Han, the Sui, and the Northern dynasties all repaired, rebuilt, or expanded sections of the Great Wall at great cost to defend themselves against northern invaders. The Tang and Song dynasties did not undertake any significant effort in the region. 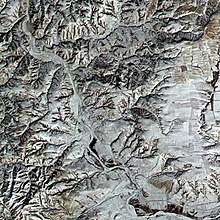 The Liao, Jin, and Yuan dynasties, who ruled Northern China throughout most of the 10th–13th centuries, constructed defensive walls in the 12th century but those were located much to the north of the Great Wall as we know it, within China's province of Inner Mongolia and in Mongolia itself. The Great Wall concept was revived again under the Ming in the 14th century, and following the Ming army's defeat by the Oirats in the Battle of Tumu. The Ming had failed to gain a clear upper hand over the Mongolian tribes after successive battles, and the long-drawn conflict was taking a toll on the empire. 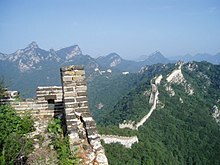 The Ming adopted a new strategy to keep the nomadic tribes out by constructing walls along the northern border of China. 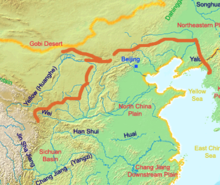 Acknowledging the Mongol control established in the Ordos Desert, the wall followed the desert's southern edge instead of incorporating the bend of the Yellow River. Unlike the earlier fortifications, the Ming construction was stronger and more elaborate due to the use of bricks and stone instead of rammed earth. Up to 25,000 watchtowers are estimated to have been constructed on the wall. As Mongol raids continued periodically over the years, the Ming devoted considerable resources to repair and reinforce the walls. Sections near the Ming capital of Beijing were especially strong. Qi Jiguang between 1567 and 1570 also repaired and reinforced the wall, faced sections of the ram-earth wall with bricks and constructed 1,200 watchtowers from Shanhaiguan Pass to Changping to warn of approaching Mongol raiders. During the 1440s–1460s, the Ming also built a so-called "Liaodong Wall". Similar in function to the Great Wall (whose extension, in a sense, it was), but more basic in construction, the Liaodong Wall enclosed the agricultural heartland of the Liaodong province, protecting it against potential incursions by Jurched-Mongol Oriyanghan from the northwest and the Jianzhou Jurchens from the north. While stones and tiles were used in some parts of the Liaodong Wall, most of it was in fact simply an earth dike with moats on both sides. 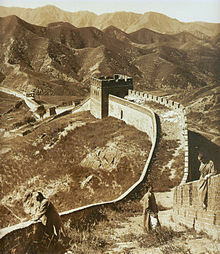 Towards the end of the Ming, the Great Wall helped defend the empire against the Manchu invasions that began around 1600. Even after the loss of all of Liaodong, the Ming army held the heavily fortified Shanhai Pass, preventing the Manchus from conquering the Chinese heartland. The Manchus were finally able to cross the Great Wall in 1644, after Beijing had already fallen to Li Zicheng's rebels. Before this time, the Manchus had crossed the Great Wall multiple times to raid, but this time it was for conquest. The gates at Shanhai Pass were opened on May 25 by the commanding Ming general, Wu Sangui, who formed an alliance with the Manchus, hoping to use the Manchus to expel the rebels from Beijing. The Manchus quickly seized Beijing, and eventually defeated both the rebel-founded Shun dynasty and the remaining Ming resistance, establishing the Qing dynasty rule over all of China. Under Qing rule, China's borders extended beyond the walls and Mongolia was annexed into the empire, so constructions on the Great Wall were discontinued. On the other hand, the so-called Willow Palisade, following a line similar to that of the Ming Liaodong Wall, was constructed by the Qing rulers in Manchuria. Its purpose, however, was not defense but rather to prevent Han Chinese migration into Manchuria. None of the Europeans who visited Yuan China or Mongolia, such as Marco Polo, Giovanni da Pian del Carpine, William of Rubruck, Giovanni de' Marignolli and Odoric of Pordenone, mentioned the Great Wall. The North African traveler Ibn Battuta, who also visited China during the Yuan dynasty ca. 1346, had heard about China's Great Wall, possibly before he had arrived in China. He wrote that the wall is "sixty days' travel" from Zeitun (modern Quanzhou) in his travelogue Gift to Those Who Contemplate the Wonders of Cities and the Marvels of Travelling. He associated it with the legend of the wall mentioned in the Qur'an, which Dhul-Qarnayn (commonly associated with Alexander the Great) was said to have erected to protect people near the land of the rising sun from the savages of Gog and Magog. However, Ibn Battuta could find no one who had either seen it or knew of anyone who had seen it, suggesting that although there were remnants of the wall at that time, they weren't significant. Soon after Europeans reached Ming China by ship in the early 16th century, accounts of the Great Wall started to circulate in Europe, even though no European was to see it for another century. Possibly one of the earliest European descriptions of the wall and of its significance for the defense of the country against the "Tartars" (i.e. Mongols), may be the one contained in João de Barros's 1563 Asia. Other early accounts in Western sources include those of Gaspar da Cruz, Bento de Goes, Matteo Ricci, and Bishop Juan González de Mendoza. In 1559, in his work "A Treatise of China and the Adjoyning Regions," Gaspar da Cruz offers an early discussion of the Great Wall. Perhaps the first recorded instance of a European actually entering China via the Great Wall came in 1605, when the Portuguese Jesuit brother Bento de Góis reached the northwestern Jiayu Pass from India. Early European accounts were mostly modest and empirical, closely mirroring contemporary Chinese understanding of the Wall, although later they slid into hyperbole, including the erroneous but ubiquitous claim that the Ming Walls were the same ones that were built by the First Emperor in the 3rd century BC. The Jiayu Pass, located in Gansu province, is the western terminus of the Ming Great Wall. Although Han fortifications such as Yumen Pass and the Yang Pass exist further west, the extant walls leading to those passes are difficult to trace. From Jiayu Pass the wall travels discontinuously down the Hexi Corridor and into the deserts of Ningxia, where it enters the western edge of the Yellow River loop at Yinchuan. Here the first major walls erected during the Ming dynasty cut through the Ordos Desert to the eastern edge of the Yellow River loop. There at Piantou Pass (t 偏頭關, s 偏头关, Piāntóuguān) in Xinzhou, Shanxi province, the Great Wall splits in two with the "Outer Great Wall" (t 外長城, s 外长城, Wài Chǎngchéng) extending along the Inner Mongolia border with Shanxi into Hebei province, and the "inner Great Wall" (t 內長城, s 內长城, Nèi Chǎngchéng) running southeast from Piantou Pass for some 400 km (250 mi), passing through important passes like the Pingxing Pass and Yanmen Pass before joining the Outer Great Wall at Sihaiye (四海冶, Sìhǎiyě), in Beijing's Yanqing County. The sections of the Great Wall around Beijing municipality are especially famous: they were frequently renovated and are regularly visited by tourists today. The Badaling Great Wall near Zhangjiakou is the most famous stretch of the Wall, for this is the first section to be opened to the public in the People's Republic of China, as well as the showpiece stretch for foreign dignitaries. South of Badaling is the Juyong Pass; when used by the Chinese to protect their land, this section of the wall had many guards to defend China's capital Beijing. Made of stone and bricks from the hills, this portion of the Great Wall is 7.8 m (25 ft 7 in) high and 5 m (16 ft 5 in) wide. One of the most striking sections of the Ming Great Wall is where it climbs extremely steep slopes in Jinshanling. There it runs 11 km (7 mi) long, ranges from 5 to 8 m (16 ft 5 in to 26 ft 3 in) in height, and 6 m (19 ft 8 in) across the bottom, narrowing up to 5 m (16 ft 5 in) across the top. Wangjinglou (t 望京樓, s 望京楼, Wàngjīng Lóu) is one of Jinshanling's 67 watchtowers, 980 m (3,220 ft) above sea level. Southeast of Jinshanling is the Mutianyu Great Wall which winds along lofty, cragged mountains from the southeast to the northwest for 2.25 km (1.40 mi). It is connected with Juyongguan Pass to the west and Gubeikou to the east. This section was one of the first to be renovated following the turmoil of the Cultural Revolution. At the edge of the Bohai Gulf is Shanhai Pass, considered the traditional end of the Great Wall and the "First Pass Under Heaven". The part of the wall inside Shanhai Pass that meets the sea is named the "Old Dragon Head". 3 km (2 mi) north of Shanhai Pass is Jiaoshan Great Wall (焦山長城), the site of the first mountain of the Great Wall. 15 km (9 mi) northeast from Shanhaiguan is Jiumenkou (t 九門口, s 九门口, Jiǔménkǒu), which is the only portion of the wall that was built as a bridge. Beyond Jiumenkou, an offshoot known as the Liaodong Wall continues through Liaoning province and terminates at the Hushan Great Wall, in the city of Dandong near the North Korean border. While portions north of Beijing and near tourist centers have been preserved and even extensively renovated, in many other locations the Wall is in disrepair. Those parts might serve as a village playground or a source of stones to rebuild houses and roads. Sections of the Wall are also prone to graffiti and vandalism, while inscribed bricks were pilfered and sold on the market for up to 50 renminbi. Parts have been destroyed because the Wall is in the way of construction. A 2012 report by the National Cultural Heritage Administration states that 22% of the Ming Great Wall has disappeared, while 1,961 km (1,219 mi) of wall have vanished. More than 60 km (37 mi) of the wall in Gansu province may disappear in the next 20 years, due to erosion from sandstorms. In some places, the height of the wall has been reduced from more than 5 m (16 ft 5 in) to less than 2 m (6 ft 7 in). Various square lookout towers that characterize the most famous images of the wall have disappeared. Many western sections of the wall are constructed from mud, rather than brick and stone, and thus are more susceptible to erosion. In 2014 a portion of the wall near the border of Liaoning and Hebei province was repaired with concrete. The work has been much criticized. One of the earliest known references to the myth that the Great Wall can be seen from the moon appears in a letter written in 1754 by the English antiquary William Stukeley. Stukeley wrote that, "This mighty wall [Hadrian's wall] of four score miles [130 km] in length is only exceeded by the Chinese Wall, which makes a considerable figure upon the terrestrial globe, and may be discerned at the Moon." The claim was also mentioned by Henry Norman in 1895 where he states "besides its age it enjoys the reputation of being the only work of human hands on the globe visible from the Moon." The issue of "canals" on Mars was prominent in the late 19th century and may have led to the belief that long, thin objects were visible from space. The claim that the Great Wall is visible from the moon also appears in 1932's Ripley's Believe It or Not! strip and in Richard Halliburton's 1938 book Second Book of Marvels. Astronaut William Pogue thought he had seen it from Skylab but discovered he was actually looking at the Grand Canal of China near Beijing. He spotted the Great Wall with binoculars, but said that "it wasn't visible to the unaided eye." U.S. Senator Jake Garn claimed to be able to see the Great Wall with the naked eye from a space shuttle orbit in the early 1980s, but his claim has been disputed by several U.S. astronauts. Veteran U.S. astronaut Gene Cernan has stated: "At Earth orbit of 100 to 200 miles [160 to 320 km] high, the Great Wall of China is, indeed, visible to the naked eye." Ed Lu, Expedition 7 Science Officer aboard the International Space Station, adds that, "it's less visible than a lot of other objects. And you have to know where to look." In 2001, Neil Armstrong stated about the view from Apollo 11: "I do not believe that, at least with my eyes, there would be any man-made object that I could see. I have not yet found somebody who has told me they've seen the Wall of China from Earth orbit. ... I've asked various people, particularly Shuttle guys, that have been many orbits around China in the daytime, and the ones I've talked to didn't see it." In October 2003, Chinese astronaut Yang Liwei stated that he had not been able to see the Great Wall of China. In response, the European Space Agency (ESA) issued a press release reporting that from an orbit between 160 and 320 km (100 and 200 mi), the Great Wall is visible to the naked eye. In an attempt to further clarify things, the ESA published a picture of a part of the "Great Wall" photographed from low orbit. However, in a press release a week later, they acknowledged that the "Great Wall" in the picture was actually a river. Leroy Chiao, a Chinese-American astronaut, took a photograph from the International Space Station that shows the wall. It was so indistinct that the photographer was not certain he had actually captured it. Based on the photograph, the China Daily later reported that the Great Wall can be seen from 'space' with the naked eye, under favorable viewing conditions, if one knows exactly where to look. However, the resolution of a camera can be much higher than the human visual system, and the optics much better, rendering photographic evidence irrelevant to the issue of whether it is visible to the naked eye. ^ "China's Great Wall Found To Measure More Than 20,000 Kilometers". Bloomberg. June 5, 2012. Retrieved June 6, 2012. ^ The New York Times with introduction by Sam Tanenhaus (2011). The New York Times Guide to Essential Knowledge: A Desk Reference for the Curious Mind. St. Martin's Press of Macmillan Publishers. p. 1131. ISBN 978-0-312-64302-7. Beginning as separate sections of fortification around the 7th century B.C.E and unified during the Qin Dynasty in the 3rd century B.C.E, this wall, built of earth and rubble with a facing of brick or stone, runs from east to west across China for over 4,000 miles. ^ "Great Wall of China". Encyclopædia Britannica. Large parts of the fortification system date from the 7th through the 4th century BC. In the 3rd century BC Shihuangdi (Qin Shi Huang), the first emperor of a united China (under the Qin dynasty), connected a number of existing defensive walls into a single system. Traditionally, the eastern terminus of the wall was considered to be Shanhai Pass (Shanhaiguan) in eastern Hebei province along the coast of the Bo Hai (Gulf of Chihli), and the wall's length—without its branches and other secondary sections—was thought to extend for some 6,690 km (4,160 mi). ^ a b "Great Wall of China 'even longer'". BBC. April 20, 2009. Retrieved April 20, 2009. ^ "Great Wall of China even longer than previously thought". Canadian Broadcasting Corporation. June 6, 2012. Retrieved June 6, 2012. ^ "Great Wall of China". History. April 20, 2009. ^ Waldron 1983, p. 650. ^ Baxter, William H. & al. (September 20, 2014). "Baxter–Sagart Old Chinese Reconstruction, Version 1.1" (PDF). Ann Arbor: University of Michigan. Retrieved January 22, 2015. ^ Waldron 1990, p. 202. Tan Daoji's exact quote: "So you would destroy your Great Wall of Ten Thousand Li!" (乃復壞汝萬里之長城) Note the use of the particle 之 zhi that differentiates the quote from the modern name. ^ Byron R. Winborn (1994). Wen Bon: a Naval Air Intelligence Officer behind Japanese lines in China. University of North Texas Press. p. 63. ISBN 978-0-929398-77-8. ^ "The Weights and Measures Act (1929)". The Legislative Yuan of the Republic of China. Archived from the original on April 25, 2014. ^ a b Lindesay, William (2007). The Great Wall Revisited: From the Jade Gate to Old Dragon's Head. Beijing: Wuzhou Publishing. p. 21. ISBN 978-7-5085-1032-3. ^ a b Waldron 1983, p. 651. ^ a b c Lovell 2006, p. 15. ^ Waldron 1990, p. 49. ^ Waldron 1990, p. 21. ^ Waldron 1988, p. 69. ^ a b c Hessler 2007, p. 59. ^ 古代长城 – 战争与和平的纽带 (in Chinese). Newsmth.net. Retrieved October 24, 2010. ^ Slavicek, Mitchell & Matray 2005, p. 35. ^ Evans 2006, p. 3. ^ "Defense and Cost of The Great Wall". Paul and Bernice Noll's Window on the World. p. 3. Retrieved July 26, 2011. ^ Coonan, Clifford (February 27, 2012). "British researcher discovers piece of Great Wall 'marooned outside China'". The Irish Times. Retrieved February 28, 2012. ^ a b Waldron 1983, p. 653. ^ Waldron 1983, p. 654; Haw 2006, pp. 52–54. ^ Karnow 2008, p. 192. ^ Szabó, Dávid & Loczy 2010, p. 220. ^ Evans 2006, p. 177. ^ "Great Wall at Mutianyu". Great Wall of China. Archived from the original on March 9, 2013. ^ Edmonds 1985, pp. 38–40. ^ Lovell 2006, p. 254. ^ Elliott 2001, pp. 1–2. ^ "Part of the Great Wall of China". The Wesleyan Juvenile Offering: A Miscellany of Missionary Information for Young Persons. X: 41. April 1853. Retrieved February 29, 2016. ^ Ruysbroek, Willem van (1900) . The Journey of William of Rubruck to the Eastern Parts of the World, 1253–55, as Narrated by Himself, with Two Accounts of the Earlier Journey of John of Pian de Carpine. Translated from the Latin by William Woodville Rockhill. London: The Hakluyt Society. ^ Haw 2006, pp. 53–54. ^ Haw 2006, pp. 54–55. ^ Qur'an, XVIII: "The Cave". English translations hosted at Wikisource include Maulana Muhammad Ali's, E.H. Palmer's, and the Progressive Muslims Organization's. ^ Haw 2006, pp. 53–55. ^ Barros, João de (1777) . Ásia de João de Barros: Dos feitos que os portugueses fizeram no descobrimento dos mares e terras do Oriente. V. Lisbon: Lisboa. 3a Década, pp. 186–204 (originally Vol. II, Ch. vii). ^ a b Waldron 1990, pp. 204–05. ^ Yule 1866, p. 579This section is the report of Góis's travel, as reported by Matteo Ricci in De Christiana expeditione apud Sinas (published 1615), annotated by Henry Yule). ^ Waldron 1990, pp. 2–4. ^ a b Waldron 1990, p. 206. ^ Waldron 1990, p. 209. ^ Waldron 1990, p. 214. ^ Hessler 2007, p. 60. ^ Rojas 2010, p. 140. ^ Lindesay 2008, p. 212. ^ "Jiaoshan Great Wall". TravelChinaGuide.com. Retrieved September 15, 2010. Jiaoshan Great Wall is located about 3 km (2 mi) from Shanhaiguan ancient city. It is named after Jiaoshan Mountain, which is the highest peak to the north of Shanhai Pass and also the first mountain the Great Wall climbs up after Shanhai Pass. Therefore Jiaoshan Mountain is noted as "The first mountain of the Great Wall". ^ "The Great Wall: Liaoning Province". Global Times. October 14, 2014. Retrieved December 4, 2014. ^ "Great Wall of China longer than believed as 180 missing miles found". The Guardian. Associated Press. April 20, 2009. Retrieved April 18, 2015. ^ "Newly-discovered remains redraw path of Great Wall". China Daily. April 15, 2015. Retrieved April 18, 2015. ^ a b Turnbull 2007, p. 29. ^ Ford, Peter (November 30, 2006). New law to keep China's Wall looking great. Christian Science Monitor, Asia Pacific section. Retrieved March 17, 2007. ^ a b Wong, Edward (June 29, 2015). "China Fears Loss of Great Wall, Brick by Brick". The New York Times. Retrieved July 1, 2015. ^ "China's Wall becoming less and less Great". Reuters. August 29, 2007. Retrieved August 30, 2007. ^ CNN, Ben Westcott and Serenitie Wang (September 21, 2016). "China's Great Wall covered in cement". ^ "The Great Wall of China, Ripley's Believe It or Not, 1932. ^ Urban Legends.com website. Accessed May 12, 2010. ^ "Metro Tescos", The Times (London), April 26, 2010. Found at The Times website. Accessed May 12, 2010. ^ a b c d López-Gil 2008, pp. 3–4. ^ "NASA – Great Wall of China". Nasa.gov. Retrieved July 31, 2010. ^ Dr. Stephen E. Ambrose; Dr. Douglas Brinkley (September 19, 2001). "Johnson Space Center Oral History Project Oral History Transcript – Neil Armstrong" (PDF). NASA. Retrieved July 31, 2010. ^ Markus, Francis. (April 19, 2005). Great Wall visible in space photo. BBC News, Asia-Pacific section. Retrieved March 17, 2007. López-Gil, Norberto (2008). "Is it Really Possible to See the Great Wall of China from Space with a Naked Eye?" (PDF). Journal of Optometry. 1 (1): 3–4. doi:10.3921/joptom.2008.3. PMC 3972694. Archived from the original (PDF) on September 10, 2008. Waldron, Arthur (1983). "The Problem of The Great Wall of China". Harvard Journal of Asiatic Studies. 43 (2): 643–663. JSTOR 2719110. Waldron, Arthur (1988). "The Great Wall Myth: Its Origins and Role in Modern China". The Yale Journal of Criticism. 2 (1): 67–104.